today presents the latest entry level graphics card GV-N430OC-1GL. GV-N430OC-1GL is built on the NVIDIA® 40nm process; supports DirectX®11, with 128 bit DDR3 high speed graphics memory and higher default GPU clock. GV-N430OC-1GL provides the best HD gaming and entertainment experience. GV-N430OC-1GL features GIGABYTE Ultra Durable 2 components to guarantee the lowest operating temperature and longer product life. 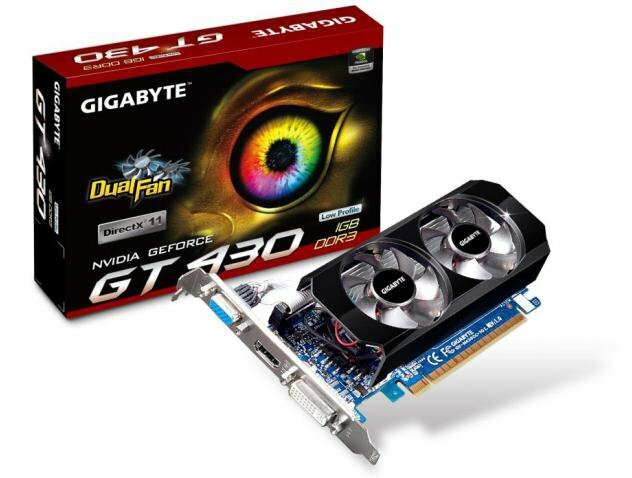 For cooling solution, GIGABYTE designs brand new low profile inclined dual fan for the entry level graphics card. The inclined dual fan doubles cooling capability and offers extreme silent environment. It also enlarges air channel and minimizes flow turbulence, reducing noise of the operating fan to offer users high quality multi-media enjoyment without interference. GV-N430OC-1GL supports NVIDIA® CUDA™, PhysX® and Blu-Ray 3D technologies. With High Definition Multimedia Interface (HDMI) connector, GV-N430OC-1GL can deliver crystal-clear digital video and audio via single cable. GV-N430OC-1GL brings users highest-quality home theater solution.